Tired of shaving, waxing, and tweezing? Our laser treatment will be your new best friend! If you are interested in laser hair removal, you certainly aren’t alone. It happens to be the most common cosmetic procedure conducted in the U.S.
A beam of highly concentrated light is shot at the follicles. The follicle pigment, melanin, absorbs the light, which destroys the hair. Lasers are so effective because of the intense precision. The laser selectively targets dark coarse hair while the skin around the hair remains undamaged. Our physicians can also adjust the laser for different skin and hair colors as well as coarseness, and location. They will use cooling agents or gels to protect your skin and dampen the pain of the laser. The feeling is similar to a pinch or a rubber band snap, depending on a person’s threshold of pain. Our physicians will also test a small area of your skin and check for reactions. Hair has a natural growth cycle. The growth cycle has three phases: anagen, catagen, and telogen. In order for the laser to have a permanent effect, the hair must be in the anagen phase. This is because the follicle has the most melanin at this time. The treatment is quick. Small areas like the upper lip or chin can be treated within minutes. Large areas, like the back or legs typically only take less than an hour. It can take up to seven sessions to completely treat an area, but most patients experience permanent results. Laser treatment offers long lasting or permanent results. Laser hair removal is quick; most procedures only take between 20 – 60 minutes. You’ll save time because you will no longer have to pluck or shave on a daily basis. Unlike waxing, you don’t need to grow hair in between treatments and you can shave. You no longer have to worry about ingrown hairs. Because this is a medical procedure with a high power laser, there are a few precautionary and preparatory steps to take. Don’t pluck, wax, thread or use electrolysis – You should limit these activities for up to six weeks before your procedure. 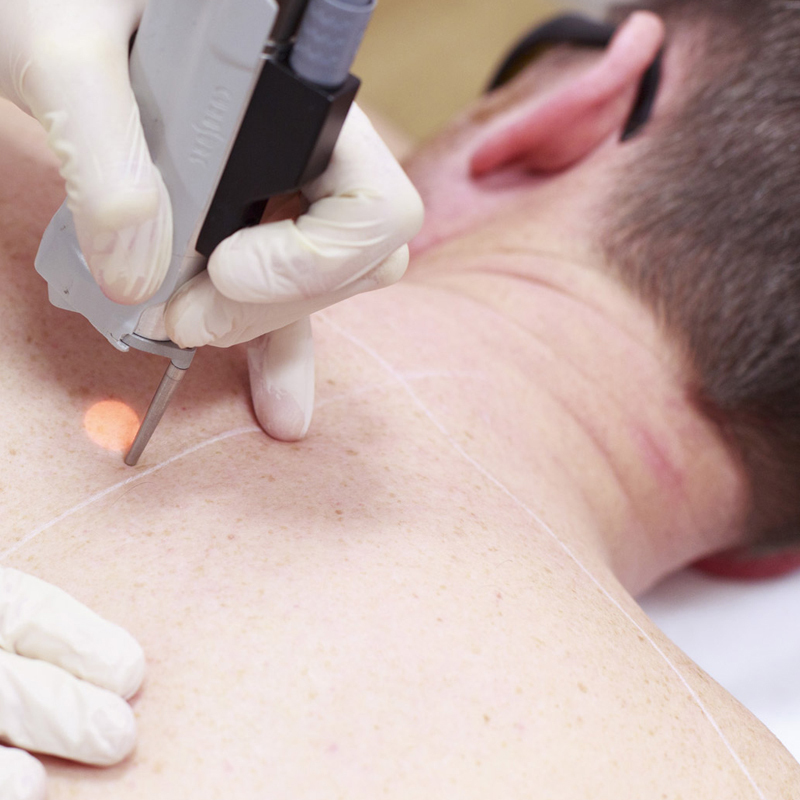 The laser targets the follicle roots, thus need to be present during the procedure. Avoid the sun – exposure can dampen the hair removal effectiveness and if you have a tan, you may complicate the procedure. Also avoid tanning lotions that provide false darker skin tone. Your treated area may look and feel sunburned for a day or two, but this only happens to few patients. You can use moisturizers and cold compresses to ease the pain. Most patients report little to no recovery time. You will be able to use makeup the next day to cover up any redness. You will want to wear plenty of sunscreen between sessions. Your hair will most likely fall out over the next month. Avoid plucking or waxing hairs that still grow, as this can diminish the effectiveness. It is best to stick to shaving until all of your treatments are complete and you no longer have to worry! If you are interested in laser hair removal, contact us today. The sooner you schedule a consultation, the sooner you will experience complete results. Remeber, at Rejuvené MD and Dermatology & Aesthetics Center of El Paso, you have board certified physicians present at all times.